We have two new chapters to announce this week in Ruby Science. If you’re already reading Ruby Science, make sure to log into GitHub and download the latest version. With this week’s updates, you’ll learn how to keep your classes from becoming junk drawers by learning to avoid Divergent Change. You’ll also see an example of using Convention Over Configuration to remove tedious boilerplate and avoid Duplicated Code. The book is a work in progress, and currently contains around 82 pages of content. 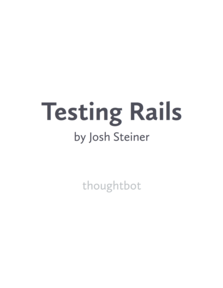 Purchasing the book also gets you access to the companion example application, as well as the ability to send thoughtbot your toughest Ruby, Rails, and refactoring questions. If you haven’t already purchased it, you can still get access for the early purchase price of $39. This Friday, the price will increase to $49.